Technology changes in what seems like seconds. So, after you’ve stocked up on new gadgets over Christmas and Boxing Day, what do you do with the old gadgets? “You can either take it to the dump or leave it in your basement,” said Lethbridge Community Network e-cycle co-ordinator Allan Schneider, who provided a third option — recycle and refurbish them for people who need them by donating them to the annual Lethbridge Community Network Annual E-cycle Drive, Jan. 10-17. 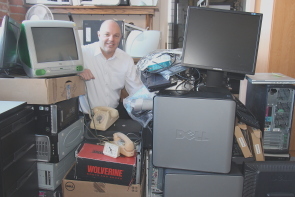 “We did this last Easter and the e-cycle drive raised 25,000 pounds of old technology,” Schneider said, surrounded by a stack of everything from old monitors, laptops and a bucket of old hard drives. They don’t offer data removal services like wiping the old hard drives, so he encouraged people to remove them on their own. If they don’t know how, he will remove the drives and destroy them. “I’ll put a nail through each one of them when I have time,” he said. There are fewer locations for the bins this year, but bigger bins which will be emptied regularly. A Calgary company, Global Electric Electonic Processing (GEEP) pays them a few cents per pound, which resulted in approximately $2,900 coming in for the Lethbridge Community Network. “ There are fewer locations and more bins this year,” he observed adding he had to empty many of the bins on his own last year. “ We need volunteers because those bins fill up fast,” he said. The technology, which can range from rotary phones to televisions and a lot of computers, monitors, cameras, DVD and Blueray players, scanners, printers and cell phones will either be refurbished and sold to people who need them at a reasonable price. He said computers are upgraded to Windows 7 before being sold to other not for profit organizations and individuals who can’t afford new technology. “We don’t have the funds to give away the computers” he said, noting more obsolete items are sold to GEEP which will dismantle, recycle or refurbish the parts of each of them. “It all gets used. Every single part,” he said. He noted some of the more unusual items donated last year were the working rotary phones, old clock radios and even an Atari video game system. He noted old bubble style security cameras have been donated as well as lots of farm lights. He said the Lethbridge Community Foundation thought holding last year’s E-cycle drive was great opportunity for people to come out and get rid of their old technology, save themselves dumping fees, reduce the amount of old technology going to the landfills and in the process, raise a little money for the Lethbridge Community Foundation to help run their programs. 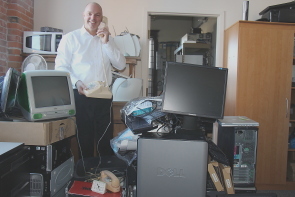 “We were overwhelmed by the amount of donations,” he said adding, not only did individuals donate old technology, but companies upgrading their technology have also donated their old tech. 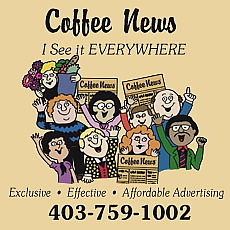 Since 2001 the non profit organization the Lethbridge Community Network has provided public access to computers, education and information technology; reaching those who may not otherwise have the opportunity to benefit from the technical world and Internet. The organization’s public mandate is funded through computer services: IT and networking support, Database solutions and Web design and development packages, geared towards not-for-profits in the local community. The organization also offers a series of four basic computer classes, taught throughout the city. Financial assistance is available to cover the registration fee when needed. They are also a licensed Microsoft refurbisher and southern Alberta’s distributor for Computers for Schools helping match educational groups with working refurbished computers. While the Lethbridge Community Network offers computer instruction, their major program is their Urban Wi-Fi initiative. They plan to double the 30 free Wi-Fi hubs all over the city in the next year. Schneider was surprised, not only by the number of items donated, but their quality as well. “People donated 42 inch LCD TVs. They still worked, but they didn’t want them,” he said. “And (in Calgary) someone donated a 72 inch TV because they didn’t like the colour,” he observed. The organization, which formed in 2003, doesn’t receive much government funding. They applied for grants through Heart of the City and received $30,000 in emergency funding from Lethbridge City council to keep their programming going last year. He said creating an intelligent community is the organization’s mandate. “ We provide computers at a reduced rate, we provide training to those who aren’t as comfortable with technology, like seniors and we provide access to technology,” he summarized. Their goal for this year’s e-cycle event is to at least equal last year’s 25,000 pounds of donations and raise $3,000-$3,500 for the group. “ But 50,000 pounds would be great,” he said.